In Japan, autumn is regarded to be the best season to enjoy arts and entertainment. From late October to early November, various design and arts events are held in the Tokyo metropolitan area, attracting millions of visitors to exhibitions and art galleries. This year, the International Linear Collider will be the theme of one of those exhibitions. Tokyo Midtown, located in Roppongi, the city’s most popular culture, art and nightlife district, is a commercial and residential complex. With various sensations such as the Ritz-Carlton hotel, the Suntory Museum of Art, the 21_21 DESIGN SIGHT museum, and 130 shops and restaurants, it attracts approximately 30 million visitors each year. “Tokyo Midtown DESIGN TOUCH” is an art and design event hosted by Tokyo Midtown every year since 2007. The master concept of the event is “enjoy design with the five senses.” The visitors can see, feel and hear artworks, and also smell and taste foods and beverages specially prepared for the event. Last year, roughly 1.43 million visitors enjoyed various design attractions and similar numbers are expected for this year, where the ILC plays a special role in the exhibition. 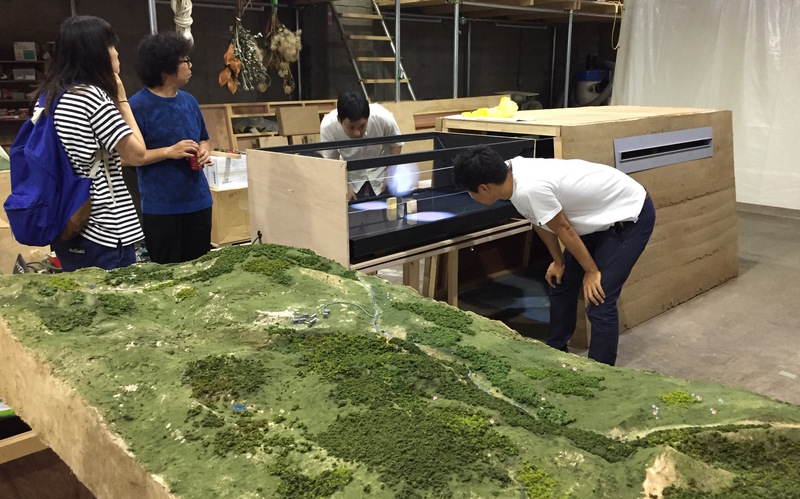 The ILC exhibition will be installed in the courtyard as a “Salone in Roppongi” exhibition. Salone in Roppongi has been showcasing Japanese design achievements since 2013 with a focus on internationally successful “Japanese design ability.” This year’s works attempt to convey science through the power of design, and the architect Jo Nagasaka chose the ILC as a theme. “I was so surprised to learn that the scientists are taking on a challenge to learn about such a tiny world by using such an extravagant system,” said Nagasaka. “I want to describe what I felt by this work, and share the feeling of wonder with many visitors,” he said. Nagasaka works in Japan as well as abroad and has extensive experience in a wide range of areas from furniture to architecture. Now, his designs have finally reached particle physics. His design approach has been always based on 1:1 scale, regardless of what size he deals with, but this was impossible this time – after all the ILC is 31 kilometres long. So he designed a 1/2000 scale model of the ILC including the landscape of the construction site. “Particle physics is very difficult to comprehend for many people, so I aim to make the subject more understandable,” he says. Nagasaka uses a technique called rammed earth, to create the land where the ILC will be installed. Rammed earth is a technique generally used to build walls or floors using natural raw materials such as earth and chalk. To build the wall, they will pour a damp mixture of earth and a suitable proportion of cement into the external frame, and keep compressing and compressing. 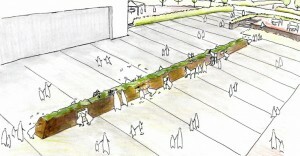 Nagasaka and his team will build a 15-metre-long wall of rammed earth at the exhibition site for the first two days of the event. “I want many visitors to actually participate in building the ILC,” said Nagasaka. After the construction site is prepared, the accelerator will be installed, and the visitors can peek into the tunnel to see some parts of the machine. At the interaction point, visitors will see a 3D image of particle collisions using holography technology. The video will be created by Rhizomatiks, the company which was in charge of the augmented reality (AR) production for the closing ceremony of Rio Olympic games. The exhibition will be held from 28 October to 6 November. Check out the detail at the Tokyo Midtown DESIGN TOUCH website . During the exhibition week, several media events are planned, and on 3 November, the organisers invited Lyn Evans, Director of the Linear Collider Collaboration, as a guest speaker. If you are around the Tokyo area, please join the construction of the ILC!